As a professional artist (see the footnote below), one way I have chosen to share my artwork is with DIY projects. Because much of my work is made using turntables, I wanted to find a way to make turntables from readily-available components. This result is the first of my projects to be accepted by Wichita, Kansas-based Arts Partners for inclusion in their classroom-based programs. 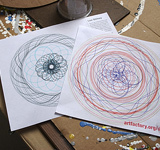 It’s not intended to be a lesson plan, but rather, is an attempt to show what the possibilities are for fun art projects that don’t cost an arm and a leg. While looking for an inexpensive way to make turntables for classroom use, I stumbled onto using two plastic cups, one inside the other. The two key components to making this work are dead simple – (1) I insert a shim between the two, preferably plastic, that is thick enough to allow one cup to spin on top of the other when they are upside down. (2) The bottom of the cup needs to be slightly concave. With enough of a rounding of the bottom of the cup, it makes the cup spin on a very small point, thus reducing friction. 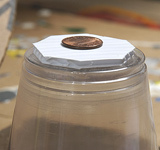 The penny glued to the center of the plastic gives the cup a more durable point to spin on. With cups facing downward, some extra stability is gained. 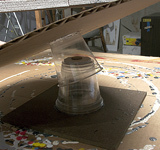 From there, all that is needed to finish a turntable is to glue, or even tape, a piece of cardboard onto the top cup. That’s the building part. 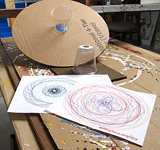 Making the art is simply a coordinated process of turning the cardboard by hand, while zig-zagging a marker back and forth. Don’t try to “make” wavy lines. The moving turntable will do the work for you. 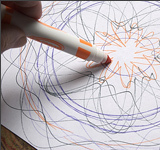 A simple straight-line stroke is all that is needed. Practice. 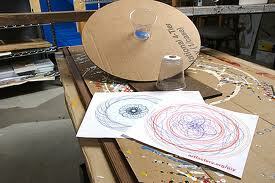 This homemade turntable can give children a great opportunity to make their own “spin art” using markers or paint. 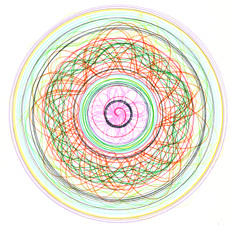 Through experimentation, they can learn about concentric circles, spirals, and the “Spirograph”-type flower petal motifs that come with experimentation and skill. Think of various household tools or toys that have motors that could be put into use in motorizing the turntable; one example is to chuck a pencil (with eraser) into an electric drill. Another would be to use a motorized car, held under the table. Improvise and explore. Lee and Lajean Shiney are the original creators and publishers of Teachnet.com. 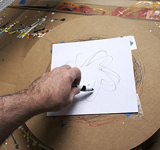 Following successful cancer treatment in 2001, Lee Shiney made a career change and became a full-time working artist. He blogs at www.artfactory.org, his complete portfolio is at www.leeshiney.com, and he has small, inexpensive work available in his Etsy store.